The cookies didn’t turn out. That’s the punch line. Hence the birth of the cookie cutter series. I didn’t really want to blog about cookie cutters. No. I wanted to blog about the Beth Moore Bible study on the life of David, since I am learning so much spiritually. I want to process what I am learning, and I want to blog about something that matters, not drivel like what to do with cookie cutters. I’m not surprised that my readership plummeted. So why didn’t I write about the Bible study? Because I’m just about brain dead, working on this 8-DVD set on “Time Travel: Writing Historical Fiction.” I filmed this creative writing class two years ago (and it came out fantastic! ), and after putting 100 hours of editing into it and seeing no progress in the editing, I lost heart. So I put it on hold for two years. I told my sister it was like eating a plate full of chopped liver, but that the chopped liver never went down on the plate. You know, like Dante’s Inferno–one of the circles of hell where you aren’t allowed to be finished no matter how much work you do. “Zero down, infinity to go,” I heard myself say every day after hours and hours and hours of work. I’m going to release the Time Travel set this year if it kills me. Yep. I’m going to finish before speaking at my next homeschool conference, which is in Seattle the middle of June. I will finish. Hence the birth of the cookie cutter series, since creating magic from cookie cutters is something I can do in my sleep almost. Since creativity is my strong point. And it started off happy. But then my kids were wondering why their lunch was always shaped like a flower. When was all this madness going to end? 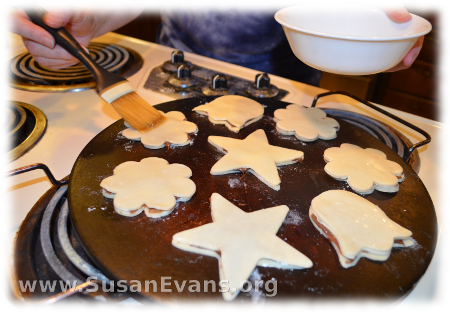 When I made the Fourth of July garland out of the star cookie cutter one night, my son Stephen declared that I was a genius the next morning. But my son Bryan (almost 13) said, rolling his eyes, “Mom, it’s April.” And so it went. You might think that 17 ideas aren’t that many, but I never told you all the ideas that failed. Like the fried egg that stuck to the cookie cutter, and I had to flick the whole thing into the sink, burning myself. Or the carefully crafted toast that I later realized was too similar to sandwiches to count. #1 Fruit Shapes: I give you tips on how to cut fun shapes out of fruit. #2 Shape Books: Shape books can encourage young writers to write fun stories, descriptions, or summaries. The booklets are just their size. #3 Sandwiches: Make these cute shape sandwiches, perfect for taking to your next tea party. #4 Tissue Paper Art: Make wonderful tissue paper art, such as flowers or stained glass windows. #5 Pancakes: Make pancakes the shape of cookie cutters. I warn you about my mistakes. #7 Patches: This is how you can make a fun patch for your clothing. #8 Gift Bags: Gift bags are another one of the many creative ways to use cookie cutters, and the recipients of your gifts will enjoy getting their gift in a unique bag. #9 Quesadillas: Go south of the border with your cookie cutter mania. These quesadillas are simple and will delight your kids. #10 Jello Shapes: These jello shapes are easy to make and disconnected from the cookie cutter more easily than any other food. #11 Garlands: These garlands will make people feel special and only take 15 minutes to make. #12 Dolls and Pillows: Some cookie cutters lend themselves well to make a felt doll. The gingerbread man cookie cutter is fabulous for this toy. #13 Rice Krispie Treats: Here is the recipe for Rice Krispie treats, as well as tips on how to get them to come out better. #14 Scrapbooking: When you need a specific shape for your pictures, you can slap down the picture, grab a cookie cutter of the desired shape, and trace around the cookie cutter. #15 Soap Shapes: Make beautiful shaped soap without having to buy an expensive kit. 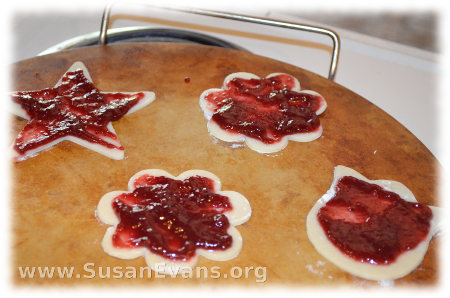 #16 Jam Tarts: Make these easy jam tarts with ready-made pie crust, jam, and a cookie cutter! 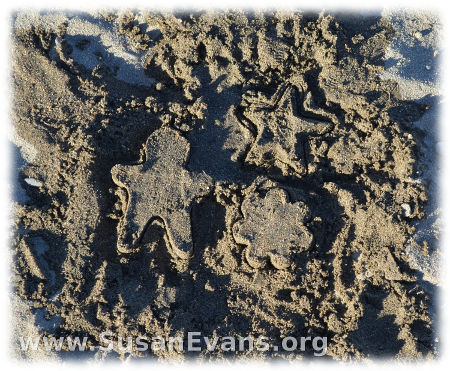 #17 Sand Shapes: Ideas for how to use cookie cutters effectively in the sand. 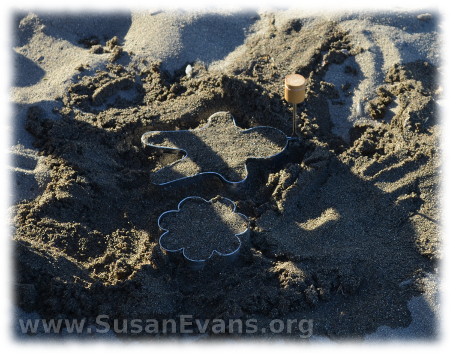 Another creative way to use a cookie cutter is to make sand shapes. 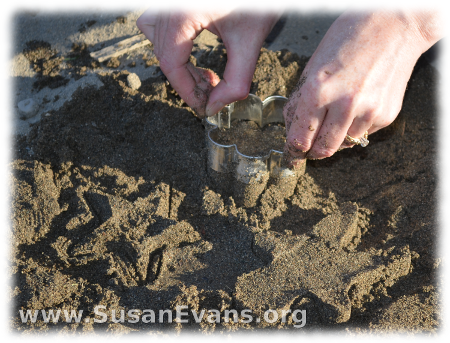 This is a particularly fun activity in the summer, when your kids want to play in the sand at the beach. You can press the cookie cutter into some wet sand, and out comes a beautiful shape. If the sand is too dry to hold the shape, just pour a bucket of water on the sand, and it will be able to hold its shape better. 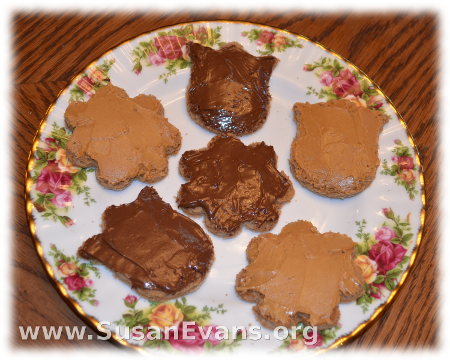 Run your fingers around the outside of the cookie cutter to get the best result from your cookie cutter shape. Fool simple people into thinking you found a fossil by taking a fish cookie cutter, and after making a fish shape in the sand, add bones by drawing lines with a popsicle stick. You can add embellishments to a sand castle by using cookie cutters in the shapes of whatever decoration you want. A square cookie cutter might be perfect for windows or the shape of rocks or bricks on your castle. A gate can also be made with a square cookie cutter. Bushes can be formed by a flower cookie cutter, if you can stand it up on its edge. I would get a flat cutting board behind it so that you can press down hard on the cookie cutter to form the bush on its side. Then lift the cutting board away. For more ideas on what you can make with sand, check out The Wonderful World of Sand and Dirt. 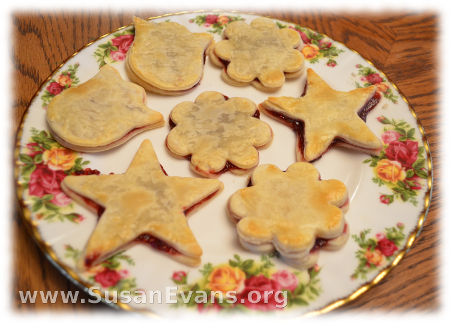 You can make these easy jam tarts with ready-made pie crust, jam, and a cookie cutter! Delightful, easy, and delicious! First you will need to unroll the pie crust. 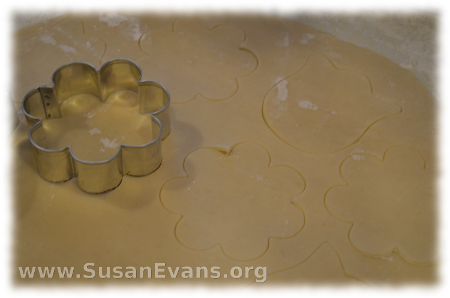 Press a cookie cutter in the desired shape on top of the pie crust. If you want to make more tarts, you can roll out the dough to make it thinner. I did the pie crust both ways (thick and thin), and they were both delicious and tasted about the same. Make sure to cut two of the same shape: one for the top and one for the bottom. Place one piece on a cookie sheet or pizza stone. (I prefer using my pizza stone for baking cookie-type foods because they never burn.) Spread raspberry jam on the lower piece of pie crust. (I also made some chocolate tarts by spreading Nutella on some of the tarts.) Then top with another piece of pie crust. If you want, you can brush the top of the tart with egg white so that it browns more nicely. Now serve these jam tarts with some British tea with milk and sugar in a gorgeous teapot, and invite friends. Enjoy the tarts!